The Museum’s 5000 pots present a range of conditions, from pristine vessels with no repair or damage, to extensively restored vessels, to reconstructed pots that are falling apart on shelves due to failing, old adhesive. These various conditions are the result of inherent technological features as well as the “life history” of the object, including its entire pre and post-excavation history. In some cases, any handling of the pot will cause significant damage. Before the pottery can be packed, transported to the CNMA or used for research, it is essential that structurally unstable pots or pots with unstable surfaces be identified and treated in the conservation lab. The Institute of Museum and Library Services (IMLS) generously funded a detailed conservation survey of MIAC's nearly 5,000 individually catalogued, whole archaeological ceramics in order to assess their condition before the planned collections move. The survey was designed, planned and carried out by the MNM’s conservators, and completed in December, 2012. 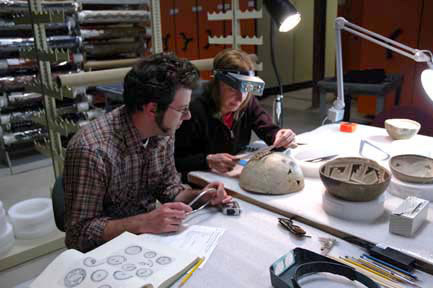 The conservation survey of the archaeological pottery collection offered a rare opportunity to review each vessel in the the Museum collection; it was therefore important that data collected be useful to both archaeologists and conservators in their efforts to ensure the long-term preservation of this important collection. To that end, a survey form was designed to record data on vessel forms, clay paste/temper, slips and paints, use wear and other evidence of use, indigenous repairs, past restorations and current condition issues. Each object was carefully examined under different lighting conditions along with chemical spot-testing of the old restoration materials. This information helps indicate specific conservation protocols for stabilization or removal. Consultations with the Museum and Office of Archaeological Studies (OAS) staff as well as various Pueblo potters shed light on our conservation examination. Each pot was assigned a Conservation Priority number from 1–5, most unstable to no need for any treatment. This information has been compiled in a searchable database and will aid museum staff and future researchers. NOTE: Issues of cultural sensitivity were addressed with the the Museum Indian Advisory Panel (IAP) before starting the survey. They approved the conservation survey of the collection. 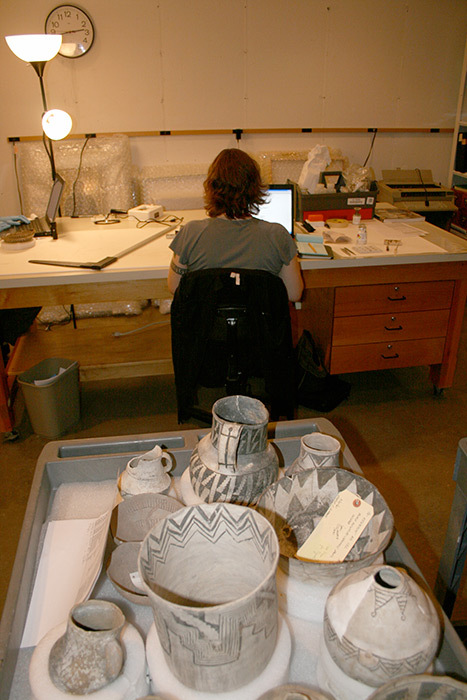 However, some pots were designated by the IAP as inappropriate for treatment of any kind; these pots will be stored in a separate area at the Center for New Mexico Archaeology with limited public access as recommended by the IAP.